Dubbed as ‘The Heart of India,’ Madhya Pradesh is not just known for its stunning edifices and beautiful places of interest, it is also known for its hearty weddings and mesmerizing ensembles that can leave an indelible imprint on any mind. With colors, brightness and kaleidoscopic hues filling the environs, weddings in Madhya Pradesh are a visual spectacle that you can’t avoid. It’s the stylish ensembles, the comfort wear and universally fashionable outfits that give these weddings an edge over the others. The textile industry of this state is highly developed and therefore, don’t be surprised if you see a spectacular exhibition of a diverse range of traditional clothing. For weddings, Ghagra Choli is popular, but saris aren’t far behind. 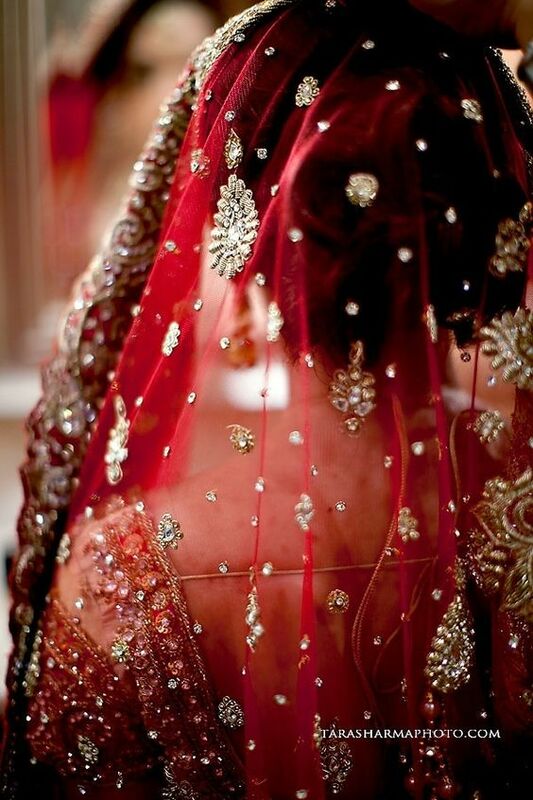 The intricate embroidery and Odhani makes a woman look her prettiest during the wedding. Men, on the other hand, are known for wearing dhoti along with Safa. For years, saris or a long 5-yard single piece of clothing has been worn during weddings in Madhya Pradesh. 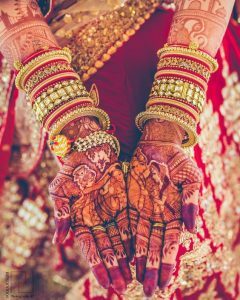 The marriage ceremony here is conducted in typical Hindu style and follows several rituals and occasion celebration that includes engagement, Shagun (a ceremony), Ladies Sangeet (a night when ladies dance and sing songs) along with the wedding day and reception a day after. The saris that have been used since medieval era includes a long cloth that is pleated and draped from the back, showcasing border design or pallu on the front side! This makes it easier to place the sari as a headgear. Over the years, saris have been revolutionized and modernized for designing Ghagra Choli, which features flair skirt of Ghagra in ‘A-Shape’ along with a Choli or long blouse, which is mostly embroidered with intricate detailing. Men generally wear dhoti and Kurta, with a jacket called Bandi worn on the top. During the wedding ceremony, they may wear a headgear known as the Safa or Chanderi Pagedi. A style of turban, this Safa is popular with males from different sections of society. Chanderi Saris are most popular for the bride along with Maheshwari saris. Both these styles are hand woven and renowned for their beauty and elaborate detailing. These saris are prepared over a course of several years and the detailed design on them is reflective of the family’s wealth. Bandhani cloth is widely produced in regions like Maundsar, Ujjain and Indore. 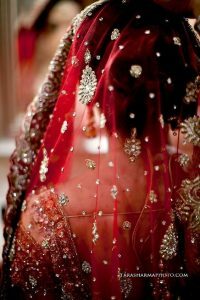 Therefore, Bandhani Ghagra Choli or suits may be worn during other ceremonies like engagement or reception. Colors are bright and the prints are enticingly fascinating. While women may wear colors like red, green, blue, yellow or orange for a wedding, immaculate white garments are preferred by men. The style of Ghagra Choli differs in Madhya Pradesh. Unlike other states where Choli is relatively less detailed, the blouses in Madhya Pradesh wedding are widely detailed. Ordhni or printed headgear made from cotton or other fabrics is used. Women may wear silver of Kathir ornaments, including bracelets and bangles on the wedding day. Mostly, raw leather shoes are used as traditional footwear. Madhya Pradesh weddings have witnessed several innovative additions over the years. For instance, Ghagra Choli has been modernized as Lehenga Choli, which includes far more detailed skirts with more designs, including fish cut, tailor ballroom frills for the added effect. Zari embroidery in gold is preferred for the bride. Similarly, men now also prefer outfits other than dhoti and may wear Sherwani, a detailed Kurta or a regular Kurta with cotton Bandi or jacket for the wedding. The dresses are now coordinated for the theme of the wedding. Universal appeal of these innovated outfits is quite high. Chanderi Saris are widely demanded all over the world because of their exceptional hand woven prints. People spend over lacs for obtaining a well-designed sari that may have been woven by the designer for years. Similarly, Bandhani is also popular, with women along with Kurtas, which have been exported to Western countries. The sari design with pallu in the front has gained fan following in recent years and debuted on the international fashion front when popular couture brands used the design for their wedding outfits.